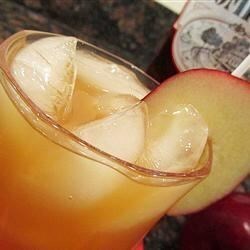 "Southern Comfort and apple cider make a tasty fall drink that calms the nerves." Fill a highball glass with ice. Pour in Southern Comfort, then fill the rest of the glass with apple cider. Stir before serving. I served this Halloween with the cider warmed and it was deelish! My friends and family really enjoyed this, thanks for the recipe! I used honey flavored whiskey. Probably a good thing I only had enough for 2 drinks. I have changed it up a bit and added Salted Carmel Stoli! It taste like a Carmel apple! What a perfect combo of flavors. Just right for fall!